The Reserve Bank of India (RBI) has signalled borrowing costs will rise further after increasing interest rates seven times in the past year to curb price rise. It has also tightened lending norms for the purchase of property to rein in surging prices. Even as the supply of residences outstrips demand, property developers, who need to repay an estimated Rs14,000 crore to banks by the end of the financial year, are facing the spectre of loan defaults as dropping stock prices make it difficult for them to access equity markets, and banks tighten lending. "A consensus is emerging that we are seeing the tip of a slowdown or a semblance of a bubble and the nervousness is evident on a pan-India level," said Amit Goenka, national director, capital transactions, Knight Frank India. The Bombay Stock Exchange realty index, a measure of 15 property stocks, has dropped 26% in the last year, compared with a 17% rise in the benchmark Sensex. The realty index has plunged 25% this year. In November, RBI asked lenders not to loan more than 80% of the value of a property priced at more than Rs50 lakh. It also asked banks to increase the risk weightage of property loans of more than Rs75 lakh to 125%, making it more expensive to lend. Risk weightage assigns the minimum amount of capital that lenders have to maintain, as a percentage, depending on how risky a loan is. "This was an additional factor along with the price rise which directly impacted investor sales in the higher end of the residential market," said Chattopadhyay. "The loan-to-value ratio being capped at 80% effectively reduces the purchasing power of a homebuyer," analysts Aashiesh Agarwaal and Chattopaday wrote in a note to clients. "With a homebuyer having to cough up additional 5-10% equity for buying a house, he may have to delay his purchase decision, leading to a fall in incremental sale volumes." The drop in residence sales has led to an increase of inventory in several cities. Mumbai has been the worst hit with about 88,000 unsold flats in the metropolitan region. About 25,000 of them are within the city limits of India's commercial capital, according to a survey of 2,400 housing projects in Mumbai, conducted by property researcher Liases Foras. 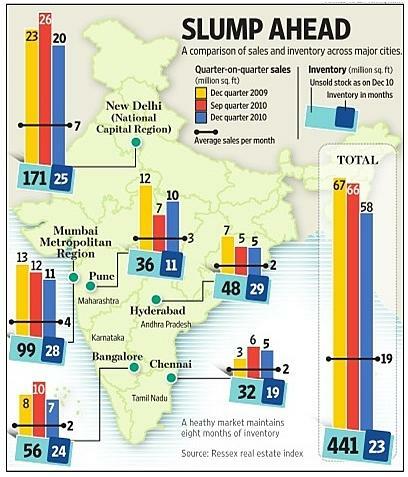 Recent home sales data suggest it may take as many as 22 months for the inventory to be cleared in cities such as Mumbai, Delhi-NCR (National Capital Region), Chennai and Hyderabad, said Pankaj Kapoor, chief executive of Liases Foras. Residential sales tumbled 15% in Gurgaon, 20-25% in Greater Noida and Ghaziabad and almost 40% in Faridabad during the last two months of the past year, according to PropEquity Research. Data from across India shows that only 15% of the home deals struck between April and September were at prices less than Rs2,500 per sq. ft, suggesting it is now difficult to buy even a 1,000 sq. ft house for less than Rs25 lakh in most cities. As a result, volumes have begun to slow and new bookings reported by major developers have been lower than expected, Credit Suisse said in their report. "Builders have started negotiating across the table and are willing to cut prices by 10-15%, but prices need to fall further to become affordable," said Kapoor. Some prospective buyers have now decided to delay their purchases until prices fall. Vishal Jain, 35, has taken a break after six months of house-hunting every weekend. Jain, who runs his own optical lens business, wants to shift from his one-bedroom apartment in Ghatkopar, a Mumbai suburb, to a two-bedroom home in the Malad-Kandivali area, another suburban destination. He has a budget of Rs45-50 lakh. "Even if I stretch my budget by another Rs10 lakh, there is nothing available other than properties in 25-year-old housing societies," Jain said. "So I can either move further north, towards Dahisar, or wait for another six months." Indiabulls Real Estate Ltd, which is developing the "Bleu" project in central Mumbai at prices that are 15-20% lower than its earlier luxury projects, has also laid out simpler terms for its buyers to ensure sales. A price correction will help propel volumes, said developers. Analysts predict a 15-20% correction in prices in NCR and rest of India, while "overheated" markets such as Mumbai and Ahmedabad would see a fall of 20% and above. "If demand is low, we may correct prices," said Vikas Oberoi, managing director of Oberoi Realty Ltd. "We have corrected prices earlier and we will do it again." In Hyderabad, the Telangana agitation has hurt both property prices and sales. In Bangalore, home to companies such as Sobha Developers Ltd and Prestige Estates Projects Ltd, sales have been stronger. "You need to keep a price that will be accepted by the homebuyer," said J.C. Sharma, managing director at Sobha Developers. "India is growing and we know people can and are willing to spend now." The decline in sales, however, has not slowed building activity. Construction in central Mumbai continues, with textile mills being torn down to make way for luxury housing and shopping projects. An estimated $10 billion (Rs45,000 crore) of new housing projects are in the pipeline in the Lower Parel area of the city, with large developers such as Indiabulls, Peninsula Land Ltd, DLF Ltd and Lodha Developers Ltd in the fray to sell about 10 million sq. ft of luxury housing at an average price of Rs15,000-20,000 per sq. ft.
Knight Frank's Goenka said that despite sluggish sales of premium homes, residences that cost Rs20-40 lakh will find buyers. Tightened bank lending, declining equity markets, private equity funds demanding steep returns and negligible property sales have compounded the trouble for property developers, said Pujit Aggarwal, managing director at real estate developer Orbit Corp. Ltd.
Indian real estate has always relied heavily on bank financing, with outstanding banking loans to the real estate sector having increased 33% in the past 21 months to over Rs1 trillion, according to Credit Suisse. Analysts say the pressure is mounting on developers from all sides. Hari Prakash Pandey, vice-president, finance and investor relations, Housing Development and Infrastructure Ltd, said that if the environment is hawkish–be it the government or financial authorities–decision-making is impacted, affecting business growth. DLF, the nation's largest developer, said after its third-quarter earnings that it is banking on a series of new properties to generate cash flow and partly pare its Rs20,694 crore debt. DLF may not meet its sales forecast of 12 million sq. ft by March, as about six of its new projects have been delayed, and due to price rises in recent months, said Angel Broking Ltd in a 1 February report. To make problems worse, banks may further tighten lending to property developers after DB Realty Ltd and Unitech Ltd have been linked to ongoing investigations into the allocation of telecom spectrum. Lenders are turning down new loan proposals and may also take a close look at the proposed end use of loans that have already been sanctioned, but not yet disbursed to real estate companies. "Investors want to know whether the money borrowed by developers for real estate purposes are being used for what it is actually meant or are being diverted elsewhere and they want to be doubly sure," said Rajiv Sahni, partner, real estate practice, Ernst and Young India.